I’ll admit that since my boys took an interest in playing with toys, I’ve generally bought licensed characters that they recognise. Fireman Sam, Mickey Mouse, Bing, Jake and the Neverland Pirates – each one of them has a pre-determined character and leaves little room for imagination in that sense. That’s not to say that my boys don’t enjoy imaginative games with them – but I never thought of purchasing what I previously thought of as old fashioned, run of the mill plastic animals. Until April of this year, that is. We stayed in a huge country house in Herefordshire as I taught my first photography course to a group of very lovely bloggers. 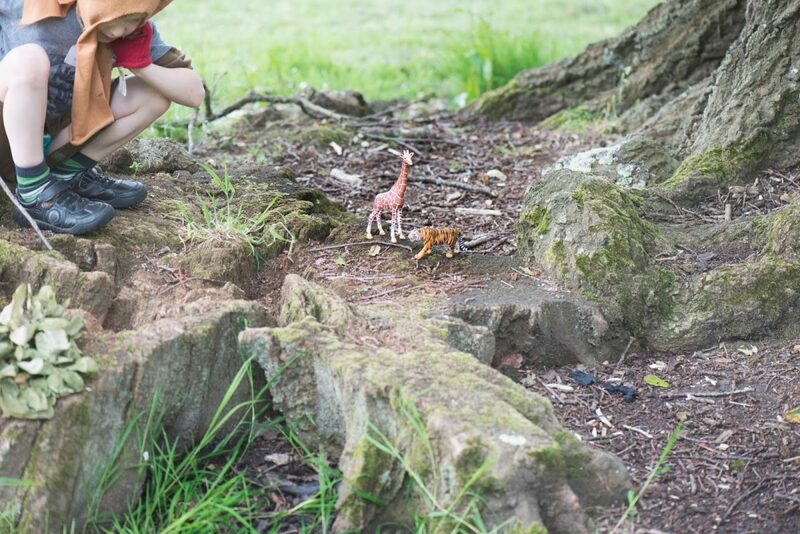 My family were there to support me [and cook], and the boys were delighted to find that the home owners had some toys for them to play with – which included two big boxes of Schleich wild animals. You know those moments that make you want to hug yourself with joy? As I was clearing up the petals of a thousand flowers from the courtyard one of the afternoons, I caught sight of Jensen and Lyoto squatting on the rocky border of the garden, next to huge bamboo bushes. 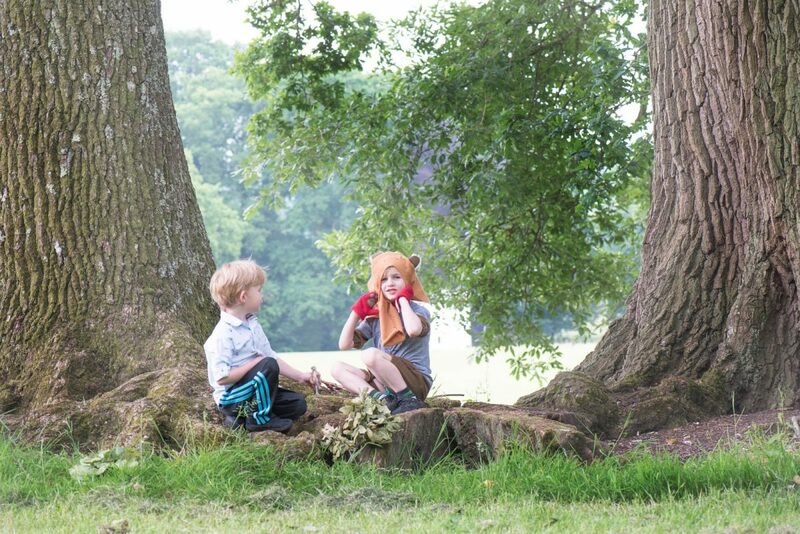 They were playing with the animals – who were on a wild adventure together. I stayed back, just watching – and they were so animated, much more than with any other toy I’ve seen them with in a long time. When we said goodbye to the animals they were pretty sad and asked if Father Christmas might bring them some. Aww. 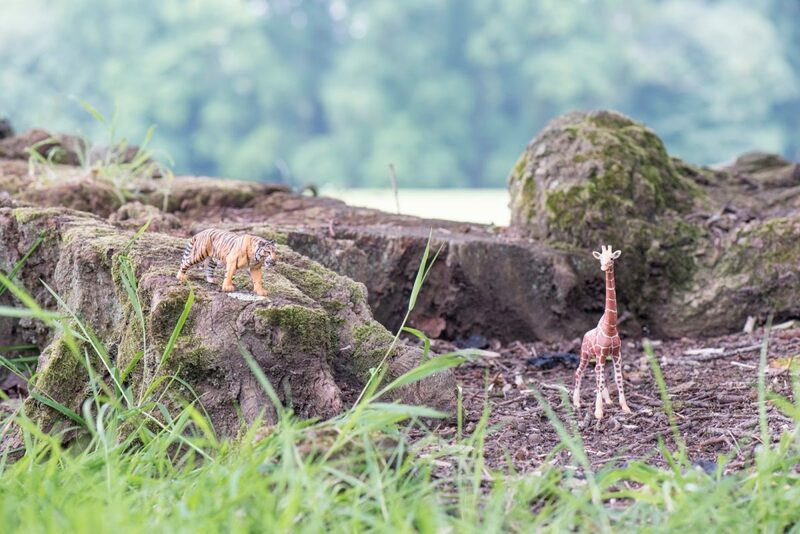 This week they were so excited to receive four Schleich animals in the post to play with – and we’ve been learning about Schleich’s hopes for children’s play diet. 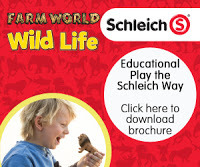 Their brochure, Educational Play the Schleich Way, guides parents to feed their children a healthy diet of playing in various ways. We took a look at the brochure – from the point of view of a parent and former teacher – and found it pretty interesting. Play is broken down into a myriad of different forms and the benefits of each are discussed with suggestions for activities. Sharing has always been relatively easy to accomplish with my boys – it’s the next step, teamwork, that’s a little harder. The drive to win or be first is very strong in little people – and so any way that they can join forces instead of competing against each other, is always welcomed with open arms! There’s no doubt that not being able to express yourself properly leads to frustration – and if you’re little, tantrums. 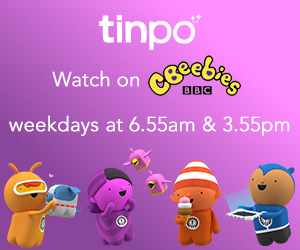 Oinking like a pig and rarrrrring like a scary dinosaur doesn’t need translating – everyone is included and little ones begin to feel happier attempting to express themselves. We loved seeing the gender issue addressed in the brochure – as a mom of three boys I often feel that the positive you-can-be-whatever-you-want-to-be gender message doesn’t quite apply as freely to boys who want to play with dolls, or dress up – and that makes me very sad. This one is so important when you have more than one child to occupy and only one of you. 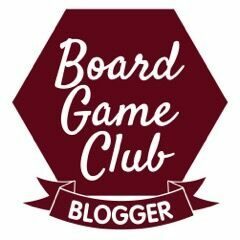 We loved all of the ideas as they’re exactly what we like to get up to! Telling stories [ours feature some a mischievous character called Mr. Bull who likes to try and take our pancakes repeatedly] playing I-Spy and taking a little toy with them who can experience whatever exclusion we’re on. The familiarity is comforting to them, and they love packing little suitcases or bags for trips. The brochure points out that entire world is one big classroom. I loved that – I just wish our government understood it – or at least took it onboard.